This entry was posted in Rescued Dog and tagged #blog, #dog, #dogblog, #dogpark, #dogs, #parktime by admin. Bookmark the permalink. Welcome spring! 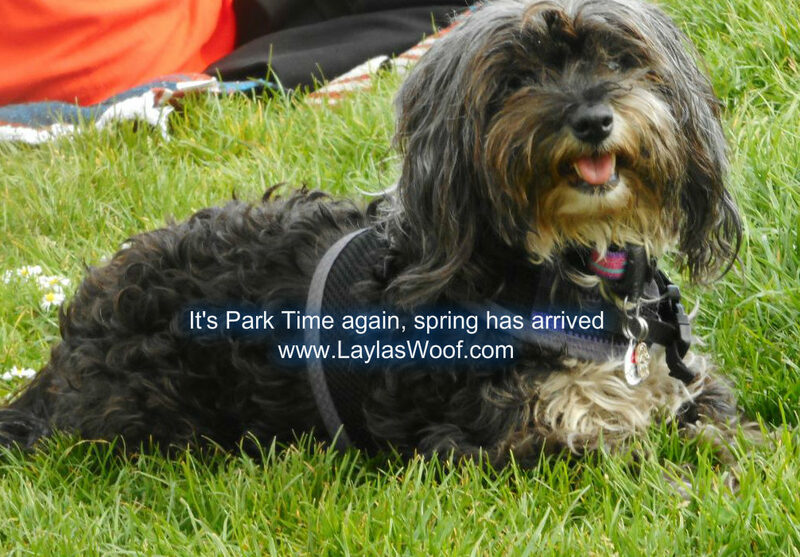 Enjoy the long walks and have fun in the park, Layla. You’re right, I don’t think we’ve ever seen Layla off on a walk. She’s definitely on a mission and love her coat. Like you said, I shouldn’t think she’d be so enthusiastic if she knew where she was going. We walk Jack to the groomers as well and he trots along nicely, until he realises where he’s going and puts the brakes on. Then we have to carry him!! Hope the weather stays nice and you get to enjoy some more park time this weekend. Shabbat Shalom. That video is so cute, Layla looks like she is on a very important mission! I’m glad the sun returned and you’re back to the usual pleasant sunny days. It’s great that Raw Paws is having such an effect on Layla’s energy. Enjoy. We’re still waiting for what’s about two feet of icy snow to go away. Layla looks gorgeous (if not a little wet in the second photo)! And what a beautiful thing, to celebrate and welcome spring with such a fabulous pup! My pups love the groomer – they march right in and play – must be lucky! Yes spring! The snow has finally all melted in the Chicago area and I can start taking Buffy for longer walks, not that she wants to go. She went for her annual physical and the vet said there is no reason not to take her for long walks. Why does Layla hug the right side? My dogs always scan the pavement every which way to look for food? Happy spring and happy trails! Layla is a great advertisement for the treats isn’t she! walks and energy and fun are just what a dog needs after a fair bit of winter weather. I’m glad that Spring is finally here too! I’m happy that it finally stopped raining near you too. Now that it’s sunny and warmer you can enjoy rolling in the grass more! Layla and Nelly have the same type of stride. Nelly is turning 12 next month, but you would never know it by the way she moves. We still have some snow here, so we haven’t been going for very long walks. I hope you have a great weekend! Layla looks very enthusiastic with the spring and the treats. We still had black ice on the pavement in spots last week and I slipped walking Kilo- smashed my ankle and knee. Boo. That put a damper on my enthusiasm. 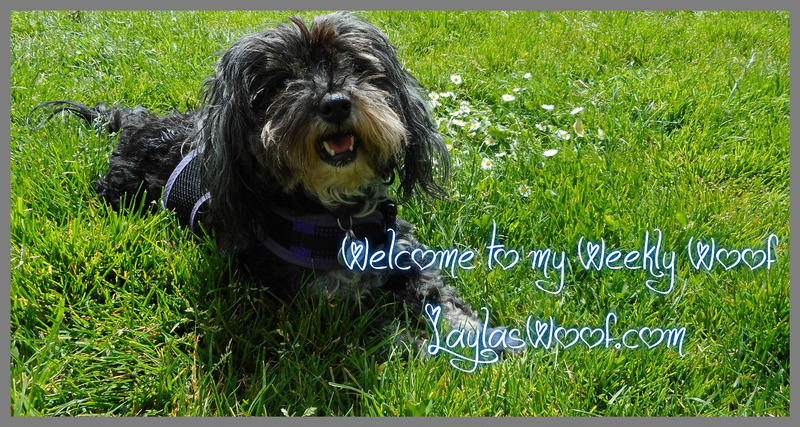 Enjoy the Spring weather Layla and family! We love the spring but hate the rainy weather! Isn’t the warmer weather and extenedight glorious! Definite park weather! Still mud season here in Michigan! Does Layla always walk right along the edge? She was on a mission, too cute! Happy Spring, Layla! I am in love! What a huge personality! Well, last weekend I was scrapping ice off my windsheild…today took the dogs out to the park for the first time in a while but still needed coats. Looking forward to spring. Looks like a lot of fun! Isn’t it amazing what good food witll do for a dog.